Last night I had a friend from college in town, Taylor, along with his nursing school friend Jessica. We had so much fun! First we went to the SweetWater Brewery for some sampling of beers (I'm not a fan of beer so the actual sampling was my least favorite part). Then we headed over to Six Feet Under seafood restaurant near Midtown. 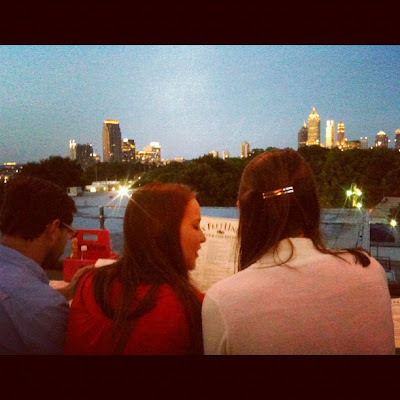 We sat on the rooftop and had an awesome view of Buckhead, Midtown and Downtown. After that we played darts and had a drink at Ormsbys, probably the coolest bar in Atlanta, which hosts all sort of fun activities; including bocce ball, skee ball and shuffleboard. I love when guests come in town, because it gives us a reason to brag on our city and show all the fun stuff it has to offer.